732 pages | 95 B/W Illus. 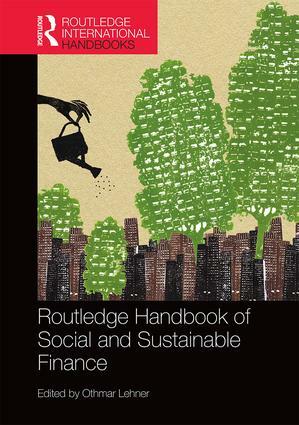 Routledge Handbook of Social and Sustainable Finance brings together an international cast of leading authorities to map out and display the disparate voices, traditions and professional communities engaged in social finance activity. With a clear societal or environmental mission, foundations, individual and group investors, as well as public bodies around the world have become increasingly eager to finance and support innovative forms of doing business. Together, founders and established businesses alike are embracing new sustainable business models with a distinct stakeholder approach to tackle social or environmental problems in what they see as a failed economic system in crisis. As a result, the topic of social and sustainable finance is at the forefront of financial economic thought. This Handbook is divided up into three parts. The first, "The Landscape of Social and Sustainable Finance and Investments", comprises of chapters from a multitude of perspectives in an effort to grasp the entirety of the landscape. The second, "Challenges, Suggestions, Critiques and Debates", focuses on areas ranging from sociological underpinnings to critical takes on markets, and the identification of specialized business models. Amongst ethical considerations, topics include the scaling of impact, an analysis of sustainability as risk prevention and comparative analyses of various methods of justification and measurement. In the third and final section, "Markets and Institutions", contributions range from various perspectives on sustainable banking to environmental marketplaces, and finally on to practical cases and country specific observations. This volume is essential reading for both academics and students in economics and finance. It is also of interest to those who study environmental economics, microeconomics and banking. 3.1.3- Clelia Fiondella - Second University of Naples & Marco Maffei - University of Naples "Federico II" Rosanna Spanò - University of Naples "Federico II"
Othmar M. Lehner is a full professor of Financeand a leading researcher in the field of social finance and impact investment. With a professional background as a bank manager, he now dedicates his academic career to the advancement of the field through research publications, advisory services, conferences, and lecturing in MBA and doctoral programmes.